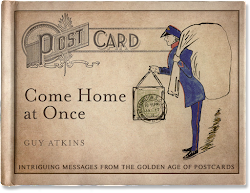 So how does someone become addicted to old postcard messages? Well, eight years ago I was in a junk shop in the Lake District in North West England. Alongside the cracked pottery and broken VHS players, there was a tray of old postcards. And to my surprise in amongst them I found a couple of my university college. Faded and battered, I thought they were well worth the £1.50 investment. But it wasn't until I was sipping a cuppa a few hours later I read the backs. The first was illegible. Something about a holiday in Bournemouth. But on the second a girl was arranging to meet a university pal in Clapham in London in 1904. The coincidence being that I now lived in Clapham and regularly made similar arrangements with my uni friends - albeit by text and email. 100 years on and strangely little seemed to have changed. So, back to the shop I went the next day and trawled through every card. The smudged declarations of love, the coded instructions and the insights into forgotten routines were simply astonishing. And I've been gripped ever since. I hope you find reading the messages enjoyable. Please let me know what stories you think lie behind them. And if you have cards yourself send them in and see what everyone else thinks. PS Follow Postcardese on Twitter for thoughts on collecting postcard messages ... Postcardese to Twitterese in one click. Great blog you have there. Thanks a lot. Glad you enjoy it. Have you got any interesting messages in your collection?